Last Cumulative Update – 16 for SQL Server 2012 Service Pack 1 Is Now Available ! The 16th cumulative update release for SQL Server 2012 Service Pack 1 is now available for download at the Microsoft Support site. Cumulative Update 16 contains all the hotfixes released since the initial release of SQL Server 2012 SP1. Those who are facing severe issues with their environment, they can plan to test CU16 in test environment & then move to Production after satisfactory results. Although, I prefer to have SP2 with latest CU in your environment. NOTE: This is the final Cumulative Update for SQL Server 2012 Service Pack 1. SQL Server 2012 SP1 exits service pack support on July 14, 2015. Cumulative Update – 6 for SQL Server 2012 Service Pack 2 Is Now Available ! The 6th cumulative update release for SQL Server 2012 Service Pack 2 is now available for download at the Microsoft Support site. Cumulative Update 6 contains all the hotfixes released since the initial release of SQL Server 2012 SP2. SQL Server 2014 Service Pack 1 (SP1) Is Now Available ! Finally after a long waiting period, Microsoft release SQL Server 2014 Service Pack 1 (SP1), Same is now available for download at the Microsoft Support site. SQL Server 2014 Service Pack 1 (SP1) contains all the hotfixes released since the initial release of SQL Server 2014 RTM. I suggest to test SQL Server 2014 Service Pack 1 (SP1) in test environment & then move to Production after satisfactory results. How to Move MSDB & Model SQL Server system Databases ? 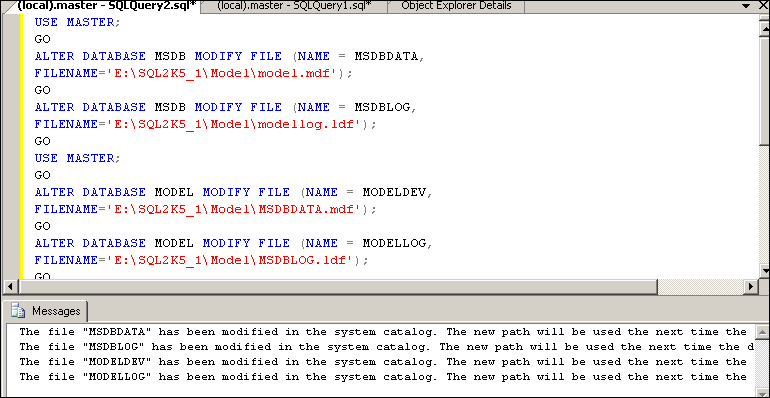 May 18, 2015 9:10 am / 4 Comments on How to Move MSDB & Model SQL Server system Databases ? You can also use “Execc SP_HelpDB ‘<DBNAME>’” for these details. The file “MSDBDATA” has been modified in the system catalog. The new path will be used the next time the database is started. The file “MSDBLOG” has been modified in the system catalog. The new path will be used the next time the database is started. The file “MODELDEV” has been modified in the system catalog. The new path will be used the next time the database is started. The file “MODELLOG” has been modified in the system catalog. The new path will be used the next time the database is started. Database snapshot captures only data changes or it will also save real database from DDL changes ? May 11, 2015 3:21 pm / 1 Comment on Database snapshot captures only data changes or it will also save real database from DDL changes ? Databse snapshot is read only databse. It’s a static view database on which only read only operaton can be performed. Database snapshot works on data page level. Before a page of the source database is modified for the first time, the original page is copied from the source database to the snapshot. The snapshot stores the original page, preserving the data records as they existed when the snapshot was created. The same process is repeated for every page that is being modified for the first time. So DB snapshot works page level & page is the smallest unit database engine can understand. Page contains the actual data, transactions and schema details. So here, I say snapshot works on page (not only data pages) and any change in page will move page to DB snapshot.